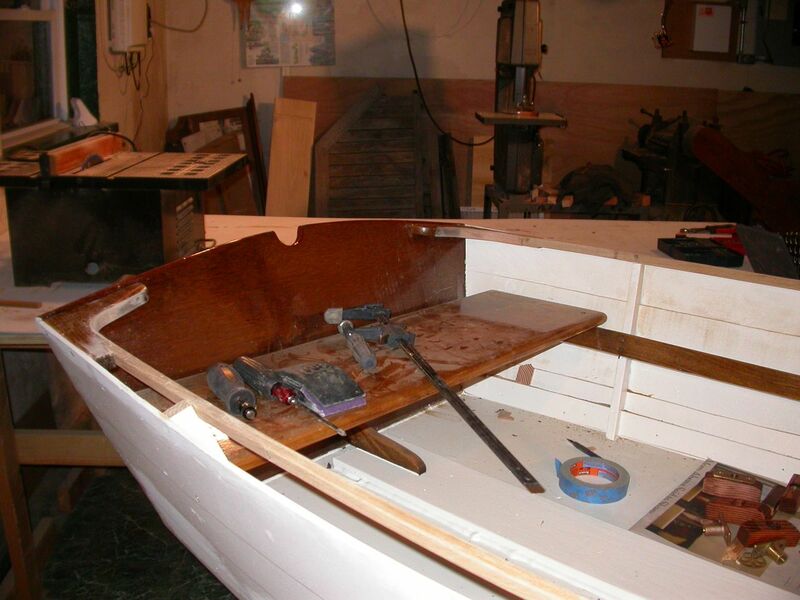 The great thing about wooden boats is that it turns a summer hobby into one that lasts the whole year round. The main problem: my winters are now too short! Since I've still got tons of work to do on the Blue Moon, I need to have Cabin Boy relaunched before the move out to the mooring. That means I have exactly 12 days to finish his refit. I'm not sure I'll make it. After my thrilling success with Cabin Boy's breasthook, I was going to build a new set of quarter-knees, just for fun. But time pressure squashed that notion. The old knees are far from perfect. In fact, if I ever write a book called, 'How Not To Build A Boat', I'll put the photo below on the cover. The grain on these knees is all wrong, and sure to fail eventually. But the word 'eventually' provided just the excuse I needed to justify a shortcut. The notch in the knee did not fit the inwale, but I thought a bit of trimming could solve that problem. 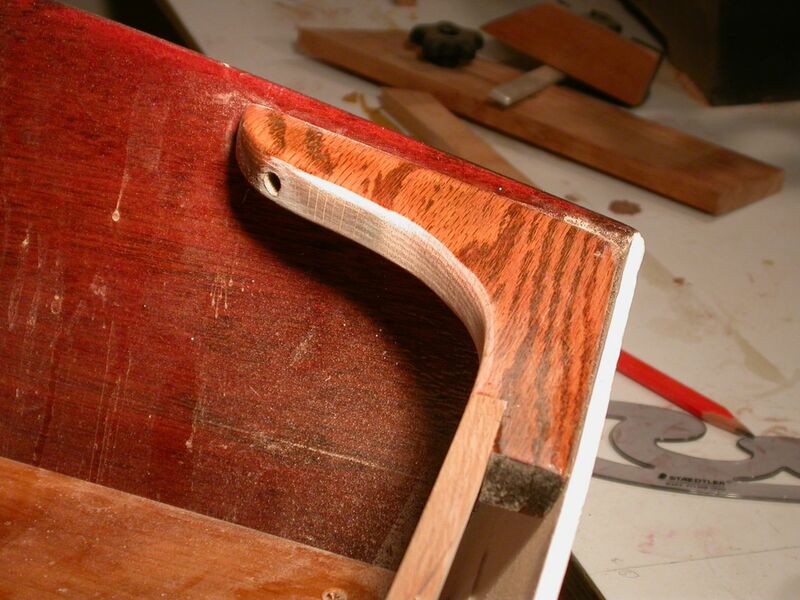 Starting from the inwale, I drew a new curve freehand, and carried the piece over to my bandsaw. A few minutes later, it fit good enough. 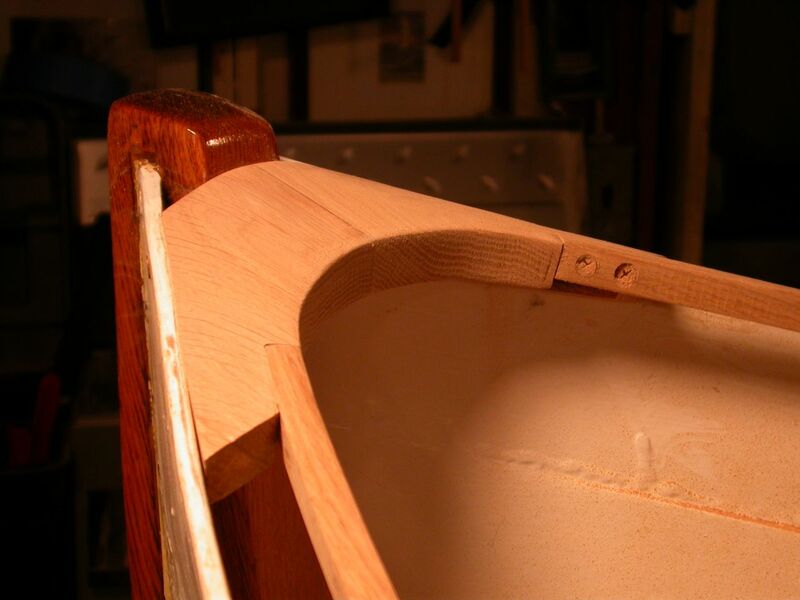 Note the sanding dust on the transom. Actually, the inwale didn't fit exactly. Almost, but not quite. Rather than stress about it, I screwed the inwale into place, and applied a bit of 80 grit sandpaper to the problem. A bit of light sanding smoothed the differences between the knee and the inwale, so that they flowed perfectly into each other. 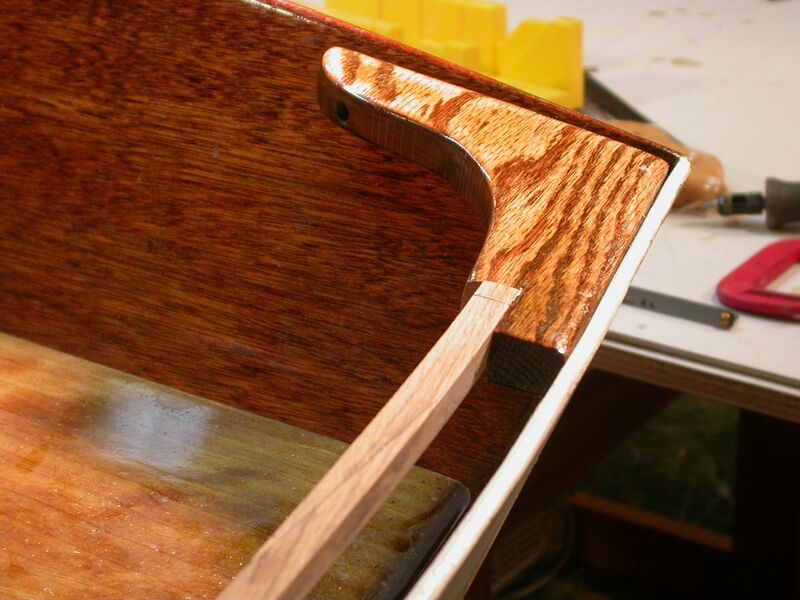 I'm sure I'm not the first boatbuilder to resort to this trick. I wouldn't try this if the fit wasn't practically perfect, but if it is, no one will see the difference in the shape of knee or inwale. Never mind all that varnishing! I made quite a mess of Cabin Boy's varnish, but a bit of vacuuming and dusting solved that problem. Then it was time to fit the inwales to the breasthook. Again, the fit was almost perfect. A little sandpaper eliminated the mis-matches. In the photo below, I've sanded the port inwale, and started on the starboard one. I remembered to stop and take a photo before finishing, so you can see that the starboard inwale is still a bit misaligned. No matter... it looked fine when I finished. 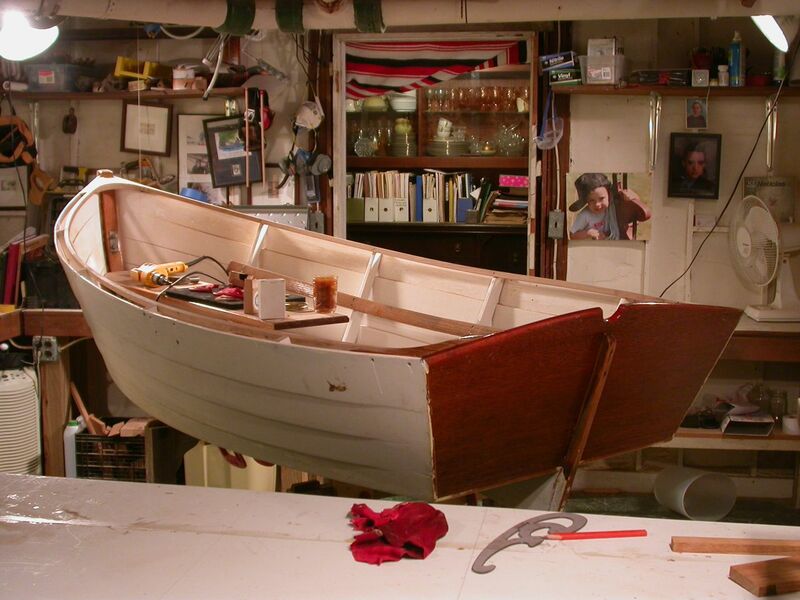 My new boatbuilding motto: don't sweat the small stuff. Here's the breasthook, inwales, and knees all screwed together. Pretty sweet, I think. A few more pieces were necessary, though. I needed oarlock pads. 4 of them, so I can have two rowing stations for my fore-'n-aft rowing seat. I cut them out of a nice thick piece of Douglas Fir that I had in my junk box. I didn't like the color, so I decided to stain them. Another chapter in my "How Not To..." book. But they are good enough for this summer. I wasn't about to throw them out and start again. 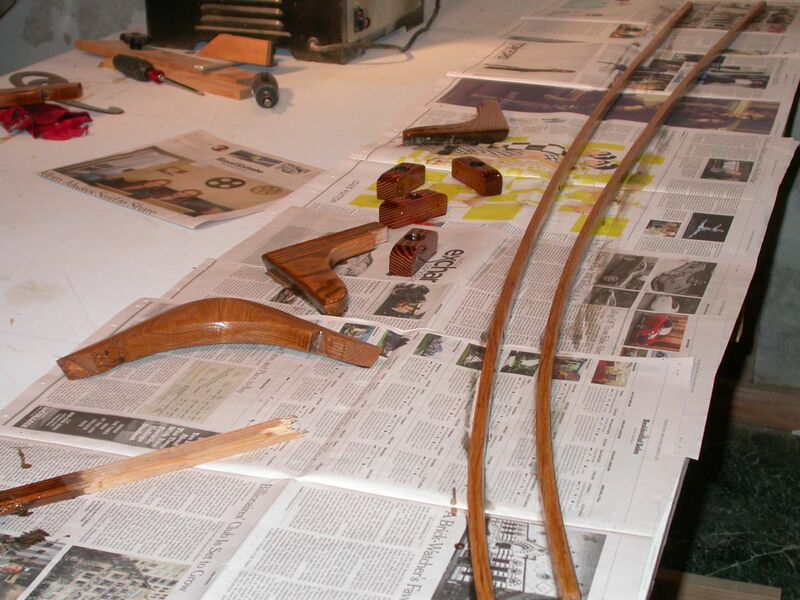 I'm not going to glue any of this stuff into the boat, so if I have the time and inclination next winter, I'll make new ones out of teak or ivory or whatever. For now, if anyone asks me what they're made of, I'm going to look smug and superior and say 'Zebra wood, of course." So, after a lot of work, I had all the interior bits and bobs screwed in and fitting perfectly. So what was the next step? Yes! Pull them all out! 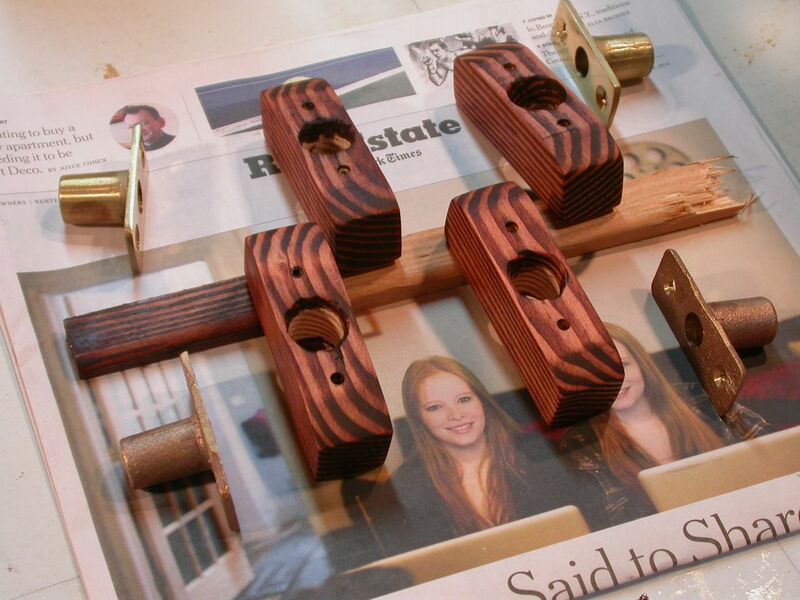 They all need to be varnished of course, but that is just time consuming. It should be done by this weekend. Everything fit? Great! Unscrew them and start varnishing. Next up, the outside of the boat. I want to affix some sort of outwale. Not sure what, exactly, but nothing complicated. But some old screw holes need to be filled, the topsides and bottom scraped and painted, and I need to finally give poor old Cabin Boy some bottom paint, as he'll be in the water all summer.